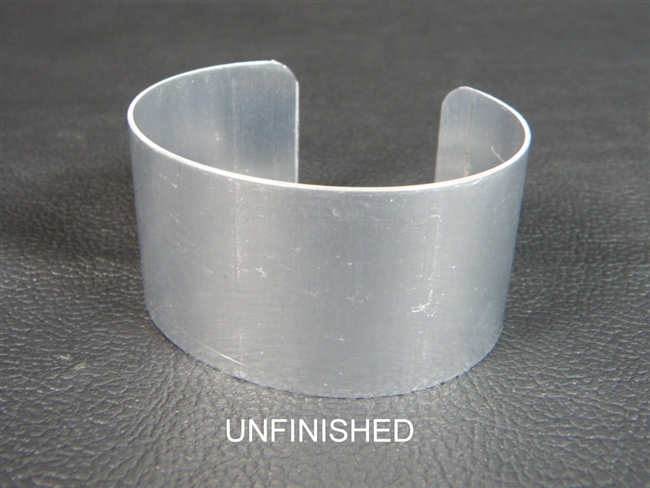 Aluminum cuff bracelet blanks, one each! Each blank is made from solid 16 gauge aluminum, making them sturdy but nice and lightweight. Each blank measures 1 1/2" x 6" (1.5 x 6). Handmade right here, in our Veteran owned and Family operated shop! These are blanks meant to be used as a base for your project; use them with polymer clay (they can be baked, cuff and all, just be sure to peel the PVC off first lol)! ), decoupage, wrapping with leathers, fabrics or ribbons, decorate with alcohol inks, glue beads and/or embellishments onto them, use for wire wrapping, paint them or do as I do....use them as a base for bead embroidery! The possibilities are endless!